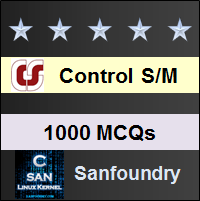 This set of Control Systems Multiple Choice Questions & Answers (MCQs) focuses on “Parameter Optimization”. Explanation: A conditionally stable system is the system which is stable only for certain values of K and exhibits poor stability at the reduced values of open loop gain. 2. The type 0 system has ______ at the origin. Explanation: The type of the system is defined as the property of the system which has pole at the origin. 3. The type 1 system has ______ at the origin. Explanation: The type of the system is defined as the pole at the zero and type 1 is defined as the 1 pole at the origin. 4. The type 2 system has at the origin. Explanation: Type of the system is defined as the number of pole at origin and type 2 is the 2 poles at the origin. Explanation: The position and velocity error of the type 2 system is zero and a constant value as for type 2 system velocity error is finite while acceleration error is infinite. 6. Velocity error constant of a system is measured when the input to the system is unit _______ function. Explanation: Velocity error constant of a system is measured when the input to the system is unit ramp function then only velocity error is finite but error due to other inputs are not defined. Explanation: In case of type-1 system steady state acceleration is infinity as for the type less than 3 acceleration is not defined it is infinity. Explanation: If the input is bounded and output is also bounded then the system is always stable and step input is bounded and the output is always under certain li its then the system is stable. 9. Which of the following is the best method for determining the stability and transient response? Explanation: Root locus is the best method for determining stability of the transient response as it gives the exact pole zero location and also their effect on the response. 10. Phase margin of a system is used to specify which of the following? Explanation: Phase margin of the system can be used for determining the absolute stability of the system.